1. If you are a newbie, Its better to try using 100% cotton fabric which has a tight weave. 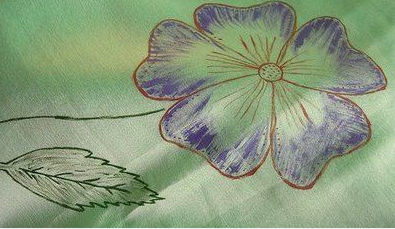 If you are painting designs that do not require sharp and precise image, loosely woven fabrics are fine too. 2. The only preparation required prior to painting is to prewash and machine dry the garment you plan to paint. Prewashing is necessary to prevent shrinkage which may damage your painting. 3. To test if your fabric needs prewashing, drop a bit of water on it. If it beads up on the surface, it needs washing. If it sinks in, you can paint directly. 4. Before painting, it is necessary to press fabric to remove all wrinkles and ensure that surface is flat. 5. If you happen to make any mistakes during painting, fear not, try lifting it out immediately by blotting it with a baby wipe or a clean brush. 6. Painted fabric need to be laid flat to dry thoroughly for preferably 24 hours before ironing it to heatset. Place a cloth over your fabric to iron or you can iron on the wrong/other side of the fabric, preventing the paints from getting into your iron. 7. 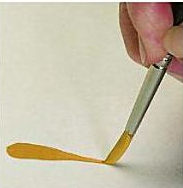 If you are using acrylic paints,there is no need to heat-set, as the paints are permanent once dry. Use round and liner brushes. For every beginner, start with a round brush . Load the no. 3 round brush with paint ( should be thin, but not flowy). 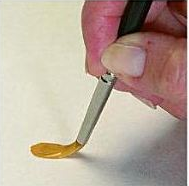 Hold brush perpendicular to the painting surface. Press the tip of the brush down, forcing the hairs to spread out, pull the brush gradually towards you. Lift as you pull toward you. As you pull, the hairs will return to a point. Do not rush the ending stroke. After mastering these strokes, you can paint lovely daisy flowers. 1.Choose the side you wish to paint. 2.Clamp this side to the wooden board using binder clips. 3.On the border, mark approximately a 12 cm thick strip, along the length of the cloth. This will be the border of your saree. 4.Using the 3D out liner, draw the pattern you wish to, on the inner and outer side (it can be a straight line or wavy line or some pattern depending on how you wish it to be). Let the pattern dry (it takes about 2-3 hours for drying). 5.Now paint the central region using fabric paints and make patterns of your choice. 6. you can stick sequins using the fabric glue in the unpainted regions. Stick them at even distances so that they shine as the orientation of light changes. 7.After the paint dries, you can outline the painted patterns with 3D out liner of your choice. It's better to choose a colour that contrasts well with both the saree colour and fabric colour, for example, on a red saree with black fabric paint, silver makes a good contrast. Let the 3D out liner dry. 8.Shift the saree to following part and paint similarly until all the border on one side is painted. 9. To create a "pallu", choose a richly decorated pattern with sequins and fabric paint being used. 10.Stitch beads to the outer side of the pallu to make it heavier so that it stays in place.